A substation in which the apparatus is equipped inside the substation building is called indoor substation. 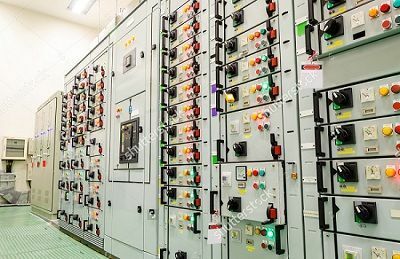 Such type of substation is mainly used for the voltage up to 11000 v, but when the surrounding air is contaminated by impurities such as metal corroding gases and fumes, conductive dust, etc., their voltage can be raised up to 33000 V to 66000 v.
The indoor substation is subdivided into several compartments like control compartment, indicating and metering instruments and protective device compartment main bus-bar compartment, current transformer and cable sealing box compartment as shown in the figure below. The switch gear on the supply or primary side will consist of oil circuit breaker only. The high voltage supply is given to the primary of the transformer through a circuit breaker. From the bus bar, various feeders emerge out. The panel on each feeder consists of an isolator switch and a circuit breaker. In addition to isolator and circuit breaker, the panel also provided the measuring instrument. For the protection of feeders usually, reverse power relay is used. For the protection of oil filled transformer Buchholz relay is used. The accessories of the indoors type substations are a storage battery, fire fighting equipment such as water, buckets, and fire extinguisher, etc., The battery is used for the operation of protective gear and switching operating solenoids and emergency lighting in substations in the case of failure of supply. 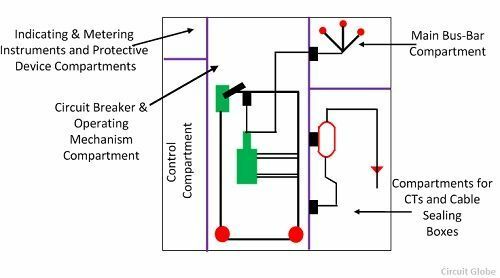 Indoor substations and transformer substation, as well as, high voltage switchboards consist of a series of open and enclosed chamber or compartments. The main equipment for this installation is arranged in these compartments. The chamber space within which the equipment of the main bus-bar is connected is called a compartment or a cubical cell. Substations of the Integrity Built Type In such type of substation, the device is equipped on site. In such substation, the cell structure is constructed of concrete or bricks. Substations of the Composite Built-Up Type In such type of substations factory or workshop are built but are assembled on site within a substation switch gear room. The compartments of such substations take the form of metal cabinets or enclosures, each of which contains the equipment of one main connection cell. In such cabinets, an oil circuit breaker, a load interrupter switch, and one or more voltage transformers may be mounted. Unit Type Factory Fabricated Substations and Metal Clad Switchboards These are built in electrical workshops and are carried to the site of installations fully pre-assembled. After installations of substations and switchboards only connection to the incoming and outgoing power circuits are required to be made. A general View of a Unit-type metal-clad switchboard assembled of several metal-clad cubicles is shown above.